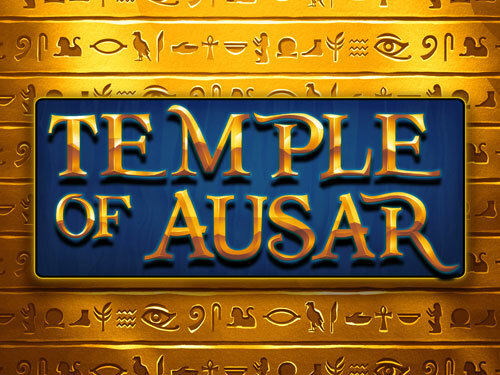 Journey into the Temple of Ausar online slot games and venture through tunnels and hidden passage ways to navigate your way to the hidden tomb that houses the riches and rubies of Ausar. This is a brilliant ancient themed online slot 5 reel that will have you constantly returning for more. Deposit and Spin today to earn your fortune at easy slots. Easy slots promotions are awesome! Go back into time to Ancient Egypt in this 5-reel 25 payline slot game. As you’d expect the symbols in the game are associated with Egypt including the Egyptian god Ausar, the goddess Isis, the eye of Horus, the crook and flail, and the scarab beetle. The colours are a traditional of blue and gold and features hieroglyphics along the bottom of the reels. 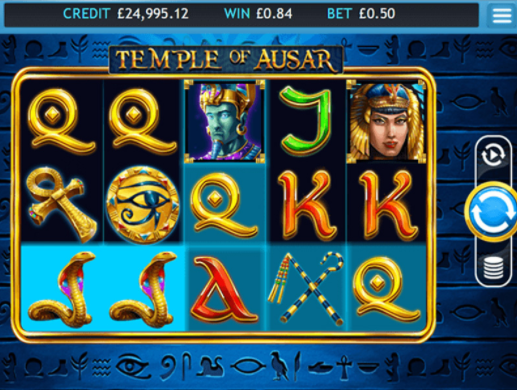 Temple of Ausar comes with wild symbols, scatter symbols, multipliers, gamble feature and free spins round. The game is playable from 25p to £12.50 per spin. The gamble feature in the game can also increase your payouts significantly. It’s a risky business but if you pull it off you can enjoy the rewards. After any winning spin you can opt to gamble your money all you have to do is guess the colour of the next card in the pack. If you guess the right colour you will double your cash but guess the wrong colour and you lose the cash from that spin. You can gamble up to 5 times consecutively. Discover more popular online slot games!